These 5, 10, and 25 cent shield paystations were originally painted red, blue and silver. The shape is that of the Independent telephone companies and also the Union Pacific Railways logo. 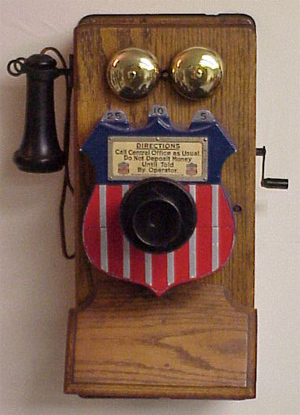 This one is mounted on a plain oak Stromberg Carlson wallphone.